If you ask Cape Wind proponents about the president of the Alliance to Protect Nantucket Sound, they'll say you're inquiring about the wrong person. "When you mention Audra Parker, you really want to be talking about Bill Koch," said Cape Wind President Jim Gordon, when questioned about her multiple attempts to block his proposed $2.5 billion, 130-turbine offshore wind project in Nantucket Sound. "She basically carries Bill Koch's water." It's common knowledge that William Koch, whose Oxbow Corp. deals primarily in fossil fuels, co-chairs the alliance's board and has donated millions to oppose Cape Wind. Koch, a longtime Cape Cod landowner, recently purchased property overlooking the Nantucket Sound in the gated Oyster Harbors community from the DuPont and Mellon families. He calls Gordon's proposed wind farm "visual pollution." But in a recent telephone interview, Koch said the idea that he is running the alliance is "pure BS," explaining that he has "too damned many projects" -- including running his multibillion-dollar company, raising his six children and building an Old West town on his Colorado ranch -- to devote much time to fighting Cape Wind. Audra Parker. Photo courtesy of Audra Parker. "I maybe talk to [Parker] for half an hour on the phone once every three months, and all she wants from me is money," Koch said. "The wind farm is way, way down on my priority list." When Cape Wind trumpets a series of legal victories as it did last Friday, it is the indefatigable Parker, 51, a first-generation Lithuanian, Massachusetts Institute of Technology graduate and widowed mother of four, who transforms Gordon's victories into apparent defeats. In her announcement on last week's decision, for example, Parker called out the two rulings in the alliance's favor (32 total decisions were made), which demand that federal agencies revisit Cape Wind's impacts on wildlife. Parker dubbed the result "a landmark win for the environment" (E&ENews PM, March 14). Offshore wind champions may dismiss Parker, but her unwavering message does get under their skin. She's been called "fire-breathing" and worse. She's received black roses on Valentine's Day. In February, she was uninvited to a major offshore wind conference in Boston -- so it "would go smoothly," a conference organizer said. Undeterred, Parker has battled for so long that some of her arguments have morphed: In a 2004 profile, she said, "The proposed Cape Wind project is based on immature technology." Ten years later, she told ClimateWire that Cape Wind's technology is "two generations old at this point" and therefore "more costly than it needs to be." Her bottom line is always the same, though: Cape Wind is a bad idea, and it has no business in Nantucket Sound. Asked why she's persisted, Parker replied, without missing a beat, "I want to win. I want to win." She repeated herself a third time: "I -- I want to win. And I believe with my whole heart that what I'm doing is right. Fundamentally. So fundamentally." Parker's determination -- or at least the 20 or so lawsuits her group has filed against Cape Wind -- has been blamed for holding up the entire U.S. offshore wind industry, which the National Renewable Energy Laboratory estimates could produce 4,000 gigawatts of power, nearly four times the current U.S. capacity. If the Alliance to Protect Nantucket Sound didn't exist, "the offshore wind industry would be well on its way to fulfilling the promise that it holds for this region and the nation," Gordon said. "There would be people working on the water now, there would be clean energy being produced." Parker dismisses such claims, pointing to the rise of offshore wind proposals like Deepwater Wind's Block Island project, which could overtake Cape Wind as America's first offshore wind farm (ClimateWire, Feb. 11). "Clearly, Cape Wind has not precluded anything," she said. Over a salad at the Hamilton restaurant in Washington, D.C., Parker explained that her fight began in 2002, shortly before her husband, a fisherman and member of the Squaxin Island Indian tribe, died. She, her husband and their four children had moved to the cape after he was diagnosed with cancer so her parents, who lived nearby, could help out. Her mother and father, Lithuanian immigrants, had owned property there since she was a child, and she grew up spending summers on Cape Cod's beaches. 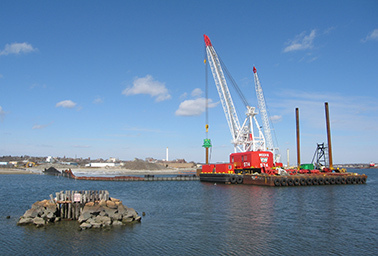 A beachhead after a long war: Construction is underway in New Bedford, Mass., for a port facility that may service the building of Cape Wind. Photo by Elizabeth Harball. But the cape's quiet lifestyle didn't suit Parker. A graduate of MIT's Sloan School of Management, she had previously held positions at technology corporations around the world. She befriended a neighbor who had left a position on Wall Street, and, Parker said, "We would get together once a week and try to figure out, 'What can we do so our brains don't rot?'" The two women eventually found part-time work at the alliance. After her husband died in 2003, Parker threw herself completely into the cause, and it wasn't long before she was in charge. Parker is now paid over $163,000 annually to run the alliance. Parker's tenure hasn't been free of controversy. When it came out last year that the alliance had spent close to $400,000 paying the town of Barnstable's legal bills for its own litigation against Cape Wind, Cape Cod Times columnist Sean Gonsalves wrote, "It's downright insulting for a town government, which is supposed to represent the entire town, to set up a special fund to accept money from a one-sided opposition group." 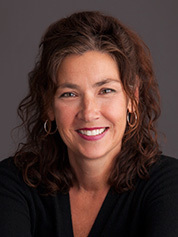 But Parker ardently believes she has Cape Cod's best interest at heart, maintaining that the alliance's sole purpose is to prevent an industrial-scale project from being built in Nantucket Sound, an area she calls "a national treasure" and argues is riddled with conflicts. What conflicts? It takes Parker well over an hour to go over her list: The turbines would harm or kill migratory birds, threaten marine mammals, interfere with air navigation, interfere with boat navigation, interfere with commercial fishing, desecrate the lands and traditions of local tribal groups, and even interfere with missile defense systems -- all issues that have played out in the courts and the review process over the years, and rarely in the alliance's favor. "There's been a lot of political favoritism, let's say, towards this project," Parker said. She's even unafraid of the "not-in-my-backyard" argument, that the turbines will mar the view as they poke up from the Nantucket Sound horizon. "Initially, it was politically incorrect to even care about the viewshed, but I think that's wrong," she said. "I think there is some value in, 'I have the right to protect my community from development that I don't think is appropriate for that area.'" "She is relentlessly on message, and in the world of communications, that's usually seen as a real positive," Rodgers said. "I question sometimes if it's really a positive for Audra. Her message is so bleak that somehow the notion that this clean renewable energy project is going to be, in her vision, some kind of an apocalypse I think just strains credulity." But the long back-and-forth has worked in Parker's favor. It's been noted more than once that Cape Wind has to win every lawsuit, while the Alliance to Protect Nantucket Sound only has to win one. By taking Cape Wind to court on one issue after another, Parker has successfully kept turbines out of Nantucket Sound. "What's amazed me is that she's been able to grasp intellectually all the potential arguments that you can use against the wind farm ... and she's done a very good job of articulating all those reasons," Koch said. "She's been very, very good at managing the lawyers, which is an extremely difficult thing to do," Koch added. "... If she weren't fully occupied, I might want to hire her on one of my businesses." It's a cold, clear morning on the Massachusetts coast. In New Bedford, a town west of Cape Cod with a nearly 10 percent unemployment rate, barges and cranes are building a terminal designed specifically to support offshore wind construction and the jobs that will come with it -- if only the industry gets off the ground. Matt Morrissey, executive director of the New Bedford Economic Development Council, has few kind words for Parker. "It is galling to me that millionaires and billionaires in gated Oyster Harbors are using their wealth and influence to try to deprive New Bedford and the region of this enormous economic opportunity," Morrissey says. "And no matter what she says, those are the people Audra Parker really works for." Later that afternoon, while eating lunch in the dim clutter of the Mass Bay Co. Army Navy in Hyannis, Mass., a tourist town on the cape, manager Paul Jeffries says he doesn't think the wind farm is a good idea. He doesn't know of Parker, but he seems to echo her, arguing that the turbines would hinder recreational boaters. "It just doesn't seem that they're choosing the right place to put them," Jeffries says. "It just seems forced." A winter storm rolls in to Hyannis. Parker leaves the alliance's offices, on the second story of a brick building not far from the Army Navy store. She drives her Lexus to a parking lot overlooking Nantucket Sound, where in the future, people might see Cape Wind's turbines spinning in the distance. Parker says it's her favorite view of the sound. But the snow is falling heavily now, and it's impossible to see what lies on the horizon.